Model A: Attachment to IPE HEA or HEB-type post with plate and backplate. For this option,tell us the beam's width and depth. Model B: Attachment to concrete or steel post with plate and backplate. For this option, tellus the post's width and depth. 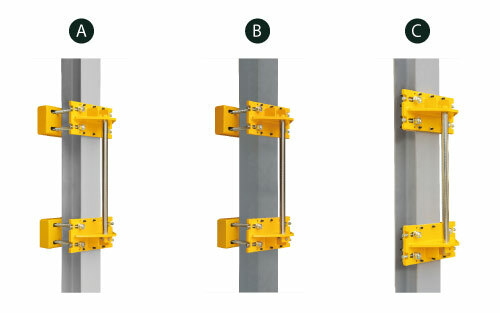 Model C: Attachment to IPE HEA or HEB-type post with clamp. For this option, tell us the beam's width and the depth of the flange. In each situation, bolts are delivered with the KITFIX system.